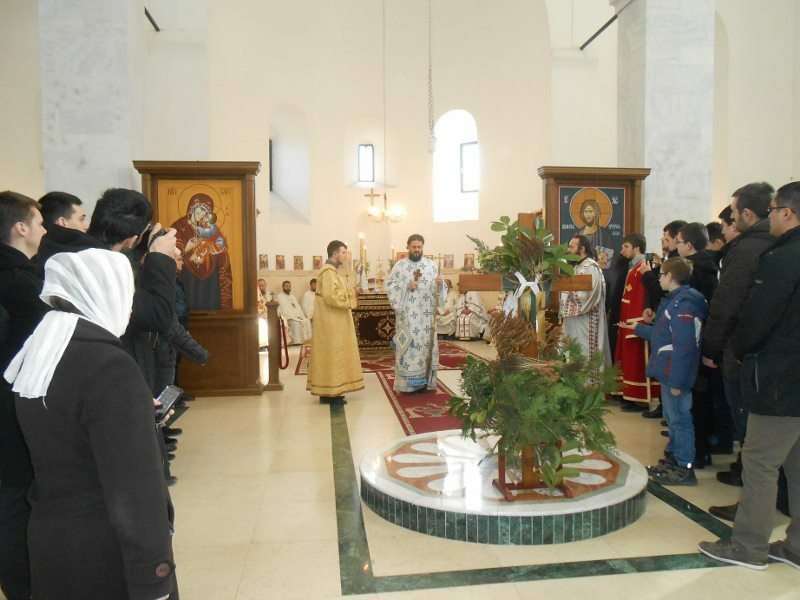 Prizren, Kosovo and Metohija - The third Sunday of Great Lent, the Sunday of the Veneration of the Holy Cross, was celebrated at St. George Serbian Orthodox Church in Prizren with the Holy Hierarchical Divine Liturgy. With the blessings of Bishop Teodosije of Ras-Prizren serving were Bishop Maxim of Western America and retired bishop, His Grace Atanasije retired bishop of Zahum-Hercegovina, with the concelebration of the diocesan clergy and monastics, and the chanting of the professors and students of the Prizren Seminary. In his festal homily Bishop Maxim spoke of the significance of the Lord's Cross which is placed in the middle of the church and decorated with flowers on the third Sunday of Lent, thus the Church shows that the Cross is a symbol of suffering but also a symbol of victory; Orthodox people do not need to be spoken at length about suffering and of the Cross, particularly the people of Kosovo and Metohija, but what is needed is to identity ourselves with the Lord's victory and His Resurrection. "Our faith is faith in the Cross and the Resurrection, for the Resurrection is that which gives meaning and significance to the Cross, which brings us out of that tragedy and drama, precisely since the Lord Himself has identified Himself with the Cross on Golgotha, so that today singing in church we say to the Cross as if it were a person: 'Rejoice life-giving Cross, Rejoice Cross of the Lord! '", said Bishop Maxim. "That was when people made God absent from their lives. But He, who knows and loves mankind, is always with us. In the second part of his homily Bishop Maxim spoke of the new danger of our time which can be called "the death of our neighbor". In his words, the "contemporary manner of living and digitilized era has repressed our neighbor from our lives." "Our neighbor that is far from us - whom we've accept through so-called social media into our circle of friends - the one we don't take note of, visit or see. A wise Italian wrote a book about this and said that it's one of the signs of the death of the neighbor, since our neighbor that is physically close to us, who is near us, lives by us, is our friend from school, is very often further away from us than our social media neighbor. We Orthodox Christians have a cure for this which is Orthodox life, Orthodox faith, the Orthodox liturgy and Holy Eucharist. It is the place where - as you see the Cross in the middle of the church, decorated with flowers and has an eschathological dimension, an Orthodox dimension. In Crete the Orthodox monastic, when they are tonsured, say a prayerful wish: 'That you find joy in your cross!' And so it is with us, with all Orthodox people. I invite you to have joy in your cross because through that joy you will rejoice in the Resurrection and the coming Lord," said Bishop Maxim. "In building and renovating and in the building up of ourselves and others, it is God's success, but it is up to us to give our hands, our work, our will, our effort. 'To the laborer God gives in abundance' says our Serbian proverb. The Apostle Paul who did more than the other apostles, says, 'Not I, but God's grace'. That we always be humble. His Holiness our Patriarch Pavle would say, 'We are God's co-laborers'. He spent Christ's 33 years in Kosovo and was beaten and driven out and other things, but he bore his cross. Even though he was small, God gave him strength. In our most difficult times God gave us him, that's why we remained and remain. The Serbian is 'arrive when needed', and 'arrive when needed', but the most important is 'exist in the dreadful place'. You are at a dreadful place, but dreadful isn't without hope. You are at such a place and that's the most important. You are priviledged and the Cross is that priviledge." Bishop Atanasije that he was just recently in America and is assured that Orthodoxy is spreading there. Even Indians joyously accept Serbs saying that Serbs are their friends. "The people there are beautiful, but their government has become alienated. The people receiving so nicely this capital encyclopedia of Kosovo and Metohija in English and greeted it and purchases copies, we'll continue further. Bishop Maxim made a great move here, after that first "Heritage of Kosovo" this is a great, now new step. You are on the ground, a living presence, you are at a dreadful place to exist. Bishop Maxim came to visit you, he brings aid. Thank God, people are helping, but we have to help ourselves. The Lord will give His support if you help. May the Lord help us and, behold, this renovation from the ashes of the Holy Archangels, the renovation of the Prizren Seminary and the renewal of our people goes with difficulty but 'whoever endures to the end will be saved', says the Lord. Never say never. 'Your head up,' our people say or the nice saying, 'he eats hay and neighs'. A horse that eats hay is slow, sluggish, but he neighs. A great surgeon from Hercegovina in Belgrade, a legend, says, 'I won't operate on a patient that doesn't want to live.' To want! The will is an important factor of man, and the other is faith. That is ours, we give to the Lord, and He will bring results. That is His. We can't ascribe anything to ourselves, but let's not lose hope. The Lord is testing us, to see if we will show his grace", said Bishop Atanasije. As always he paid much attention to the children and this time, other than Milica in Prizren, there were four others: little Pavle, son of Fr. Slobodan, not even a year old, Simonida and Dimitrije from Gracanica and Atanasije from Orahovac. The children enjoyed his company, listening to jokes and puns on his behalf. 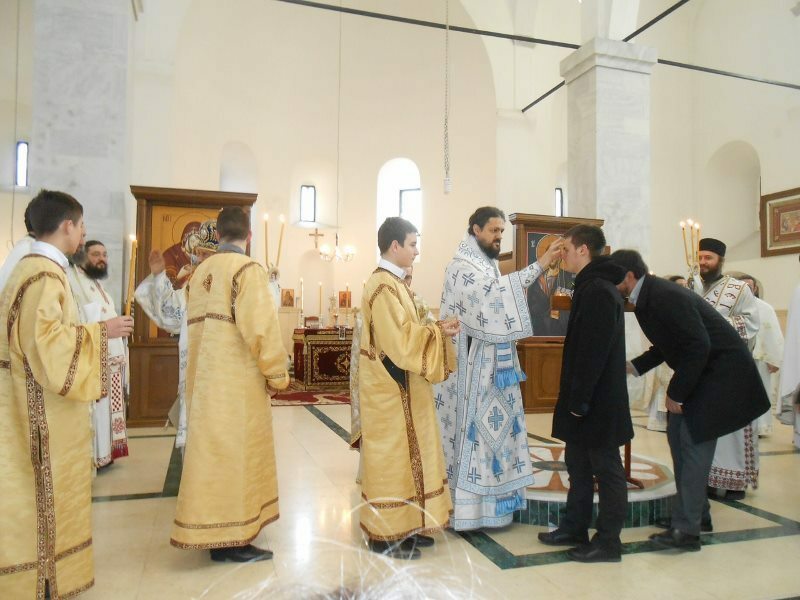 The Prizren Seminarians sang with the guests the hymn of the Seminary, and then bid farewell to their guests who continued in their travels in Kosovo and Metohija. They also visited Monastery Visoki Decani during that day. 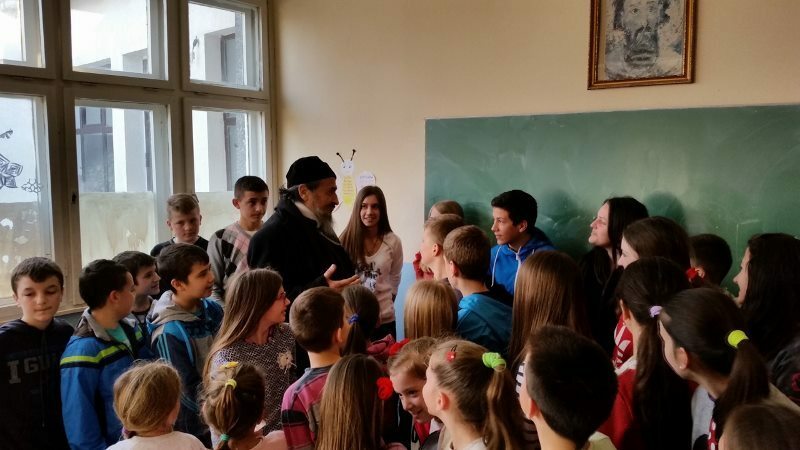 Bishops Maxim and Atanasije also visited Babin Most and Donja Brnjica the day before, where they distributed financial help and presents to the children.